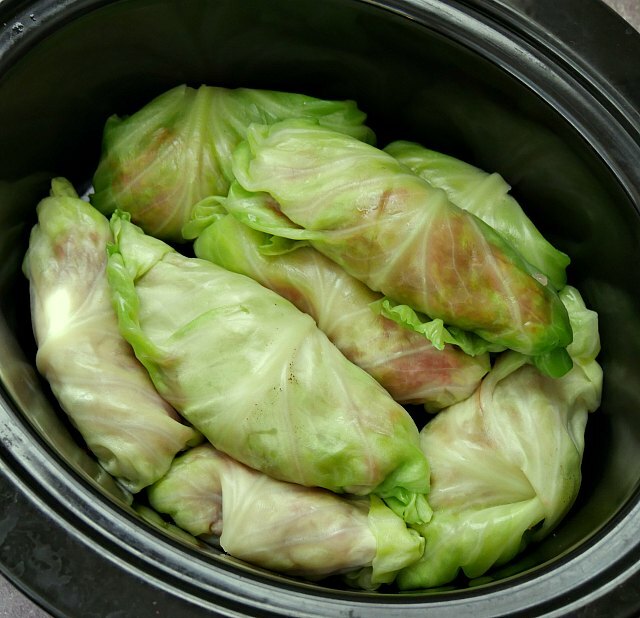 Slow cooker cabbage rolls are moister and more flavorful than ones baked in the oven. Stuffed with beef and rice and simmered in a tomato sauce all day long, this comfort food makes enough to feed families. Cabbage rolls, or stuffed cabbage, are one of my all time favorite foods. I love them so much that instead of the traditional ham sandwiches served at graduation open houses where I grew up, I served cabbage rolls. It was delicious. This is my first attempt at making cabbage rolls myself and let me just say, they turned out fantastic! This is not exactly a quick recipe, but the end result was well worth the time and effort. Cabbage rolls slow cooked in a slow cooker will be moister and more flavorful than ones that are baked in the oven. When steaming the cabbage, you will see a point where the cabbage turns a bright green. The leaves are ready to peel off then. I got about 2-3 leaves off and then had to put the head back in to soften up the head more. You will want to try and use converted rice for the cabbage rolls. Converted rice takes longer to cook so it doesn't turn to mush in the cabbage rolls. The good news is that Uncle Ben's Original Rice is converted rice so it's easy to find in the grocery store. The cabbage was really easy to roll up but careful not to rip it (too much). 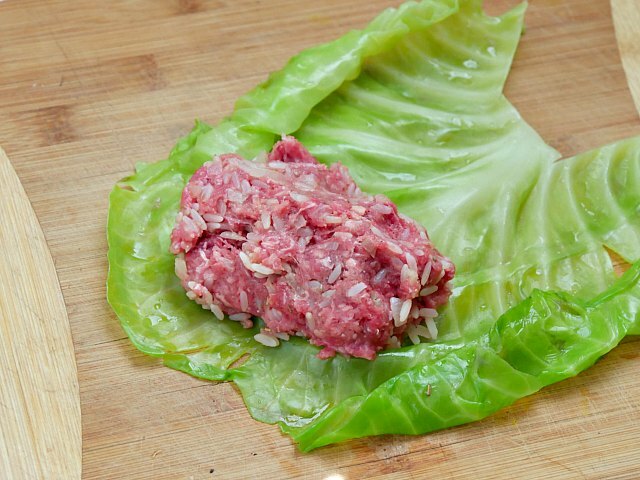 Put about 1/3 cup of the meat mixture at the top a cabbage leaf. Use a 1/3 cup to just measure out the mix and plop it right on the cabbage leaf. Keep rolling to the end of the cabbage leaf. When you reach the end, tuck in the ends. You may want to cut off the thick rib from the leaves. It will leave a little split at the end. Just tuck it all in. Lay the stuffed cabbage leaves in the crock of a 6 quart or larger slow cooker. You may get to a point in the cabbage where it's difficult to get the leaves off the head in a whole leaf. That's fine! Just stop and call it good. Once all the cabbage rolls are done and layered in the slow cooker, pour the tomato sauce over the rolls. Put the lid on the slow cooker and turn it on low. You can also cook on high if you are in a hurry just cut the time in half. 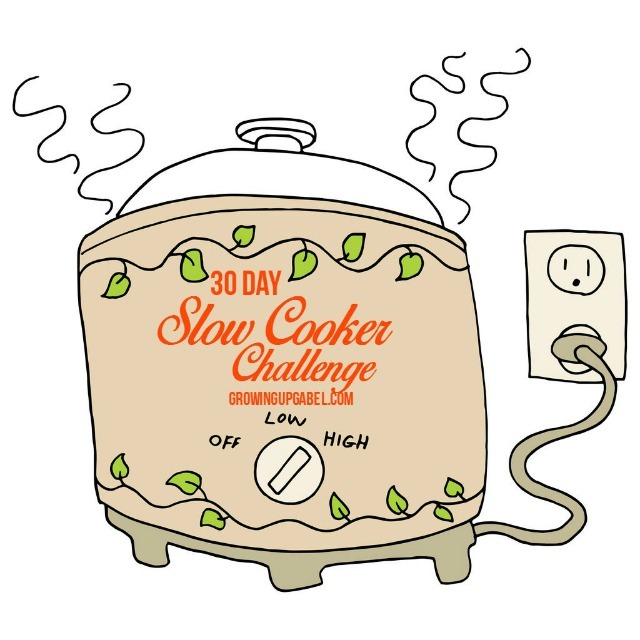 Check out all the recipes in the 30 Day Slow Cooking Challenge! COOK THE CABBAGE: Fill a large pot three quarters full of water and lightly salt. Place the pan over high heat and bring the water to a brisk boil. Add the cabbage, cover the pot and cook until the outer layers of the cabbage peel off easily. Remove the tender leaves and pick out 10 of the largest leaves. Remove the thick ribs in the center of each leaf. Set aside. PAR COOK THE RICE: Fill a medium saucepan three quarters full of water and lightly salt. Place the pan over high heat and bring the water to a boil. Reduce the heat to medium and stir in the rice. Cook for 5 minutes then drain and rinse under cold water and drain well again. Set aside. PREPARE FILLING: Melt the butter in a skillet placed over medium heat. Stir in the onion and cook 5 minutes, stirring often, until the onion is soft. Stir in the garlic and cook for 1 minute longer. Remove from heat. Place the onion and garlic into a mixing bowl. Stir in the par cooked rice from Step 2. 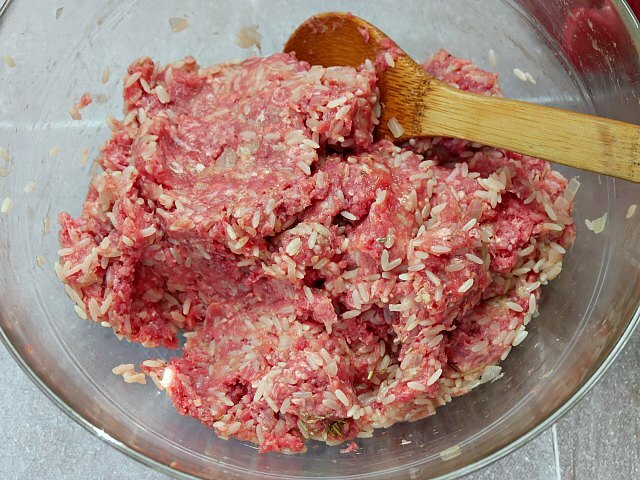 Add the ground beef, egg, rosemary, salt and pepper and mix until well blended. 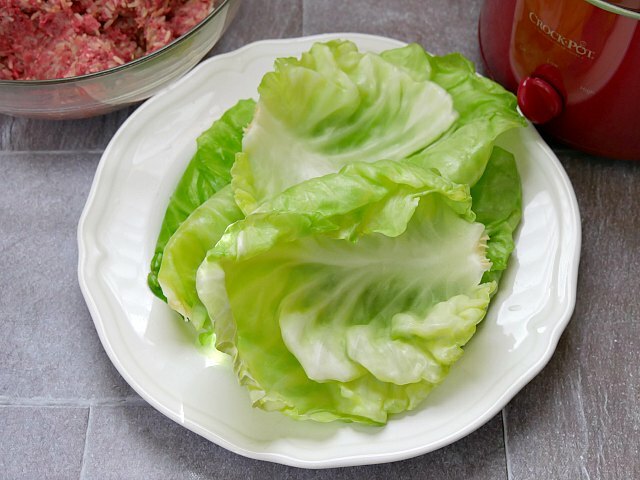 MAKE THE ROLLS: Spread 1/3 CUP of the filling into the center of each cabbage leaf. Fold the sides of the leaves over the filling and roll up the cabbage. Place the cabbage rolls, seam side down, into a 6 quart or larger slow cooker . Repeat until all the cabbage leaves and meat mixture are used up. MAKE SAUCE: In a mixing bowl stir together the tomatoes with their juice, brown sugar and lemon juice. Pour the mixture over the cabbage in the slow cooker. SLOW COOK: Cover and cook on low 6 hours or until the cabbage is fork tender. I have made this recipe twice, it’s absolutely delicious. However the sauce has turned out a bit watery both times, I’ve followed the recipe exactly so I’m not sure why its turning out that way.. maybe from the ‘steam’ in the crockpot? But it’s a pretty noticable amount of water so I’m not sure that’s the cause…any thoughts? The sauce is pretty thin. It’s not thick like a marinara. If you want a thicker sauce, I’d add a jar of spaghetti sauce at the very end. I’ve never done it but I don’t see why not! I’m confused about step two. Is the rice suppose to be cooked or just added the the meat mixture raw? You par cook the rice for 5 minutes. It must be converted rice (it takes longer to cook so it doesn’t turn to mush). Just wondering, do you cook ahe rice first or addit uncooked? I love stuffed cabbage, but this recipe confounds me. You say to add 1/3 of the mixture to each leaf. That would make 3 rolls, not 10. And then you answer the question about raw or cooked rice and say it’s raw…. when the recipe calls for boiling it for 5 minutes??? Have you ever cored out a cabbage head and stuffed the whole thing? Turn it over so the stuffed end is down. Then you simply cut the whole cooked head into 6ths or 8ths. It makes a very pretty presentation. Yes, you need to par cook the rice for 5 minutes before adding it to the meat. But it must be converted rice (Uncle Ben’s is converted rice). Put 1/3 CUP (not 1/3 of the mixture) in to each cabbage leaf. No, I haven’t stuffed a whole cabbage! Sounds like it’d make a fun family dish. 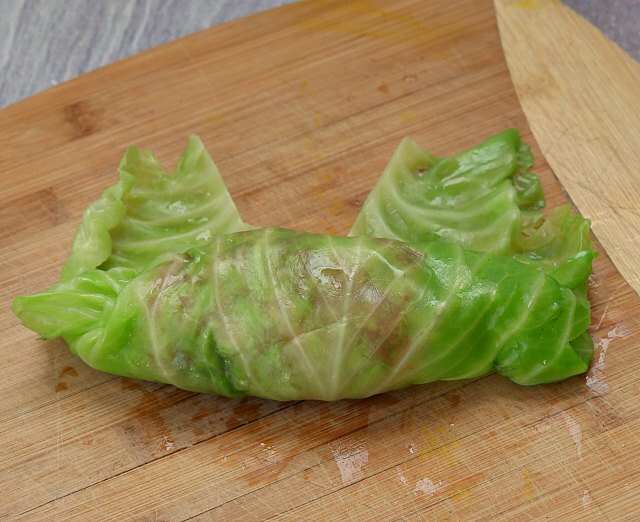 I have been making cabbage rolls for many years and I always freeze the leftovers. They are so delicious. No need to worry about freezing them. Just the right amount of spiciness. I plan on making these again – soon. I love how you write your recipes…so sweet and “real”. Please keep up the good work. Yo los preparo casi de las misma manera pero, con menos carne y más arroz y otros vegetales como el morron rojo o amarillo. Los sobrantes de repollo se colocan en el fondo de la olla con 2 o 3 rodajas de limón. Los acomodo en círculos y los cubro con una tapa de olla más pequeña y le coloco un elemento pesado (1 o 2 piedras) para que no se rompan. Cubro con agua o caldo hasta las tapa de la olla y los cocino por 35 a 40 minutos. Cuando algún arroz que este flotando pruebo y está listo. Los sirvo caliente con: pesto, aceite de oliva y limón o salsa roja (tomate). Espero que les sea útil. This recipe have become my family’s favorite!! Thanks for sharing! My Mom used to use a thin bacon rind to add flavor. I use real bacon and also we used sauercrut! I alternate bacon, then, cabbage roll, then sauercrut and last tomato sauce then start all over again! The flavor is outstanding. Want to save this recipe but can’t find out have to save it. Hi Carol! You can print it, save it to Pinterest, or perhaps favorite it on your web browser. Cabbage rolls have always been a favorite of mine and I make them in the oven.I’m going to used the slow cooker next time! This sounds super yummy! Thanks for sharing with Share Your Cup. I’m sure it’s not intentional, but I’m not seeing a link back to the party. Thanks for sharing with SYC. 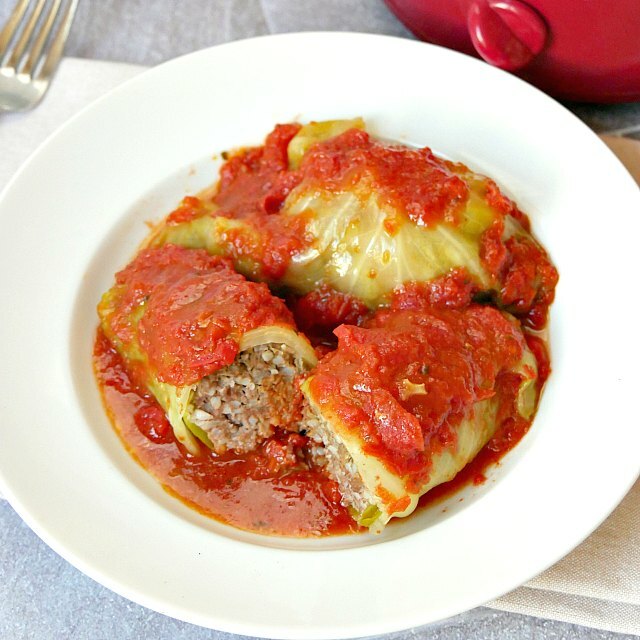 We love stuffed cabbage rolls – my Weight Watcher’s recipe is one of the most popular posts on my blog – go figure! Your version looks really good! Thanks for sharing with Fiesta Friday. Your Cabbage Rolls are perfectly rolled, they look delicious!Thanks so much for sharing your post with us at Full Plate Thursday. Have a great week and come back soon! I’ve never had these, but they sound simply amazing! Will have to pin this for later! Your cabbage roll recipe sounds and looks delicious. Thank you for sharing at Snickerdoodle. I am featuring your recipe at the party this week. I have thought about making cabbage rolls but just haven’t attempted it. I like things I can do in my slow cooker, so I’m pinning to give this one a try. Delicious!!! I’ll use a bit less brown sugar next time, but this was definitely a winner! My daughter loves it!!! These were delicious. My husband said they were the best I’ve ever made! Going to try this haven’t had cabbage rolls in years. Don’t waste the rest of the cabbage. Cut it into shreds with a sharp knife and line the bottom of the crock pot before putting in the rolls. It wuill simmer away in the sauce and is absolutely delish. You can also omit the brown sugar and added a small can of saurkraut, drained. Toss with the shredded cabbage, It adds a nice zip to the recipe. Why is this recipe under “low carb”? It is not low carb. 42g of carb? It sounds good, but should be in a different catagory. I bought the largest head of cabbage I could find so I’d have larger leaves. I also cut around the core at the bottom and steamed in the microwave. It was much easier to peel the leaves off. I also took the extra cabbage left over and added it to the crockpot to eat with the rolls. I love cabbage rolls, but haven’t made them for many years. This got me thinking of a recipe called Bubble & Squeak which has all the ingredients & flavor of cabbage rolls without all the work. You cut up the cabbage & cook it all together in one pot. It would bubble when it cooked & the cabbage would squeak when you stirred the pot. I believe this is how it got it’s name. I think this could work in a crock pot as well. I love that! I will have to do some digging to see if I can find the recipe. Core your whole head of cabbage and then stick it in the freezer overnight. Thaw the next day. Leaves peel off head easily. I use my crock pot for a marinara sauce . Three 28oz.cans of Peeled Plum Italian Style Tomatoes , two 14.5 oz.cans of Stewed Tomatoes Italian Recipe , two 8oz. cans of sauce , and one 8oz. can of paste . Salt, pepper, 2 tbsp. sugar(brown) , 2 large leafs of basil cut up fine or 1 tbsp. of dried basil , 1 tbsp. of dried oregano , 1 med. onion cut up fine , 2 cloves of garlic cut up fine . Cook on high for two hours then use a masher to break down plum and stewed tomatoes . Simmer on low for three hours . Use a large spoon to draw off thin liquid . This will yield a much thicker sauce . These look really good, Camille! 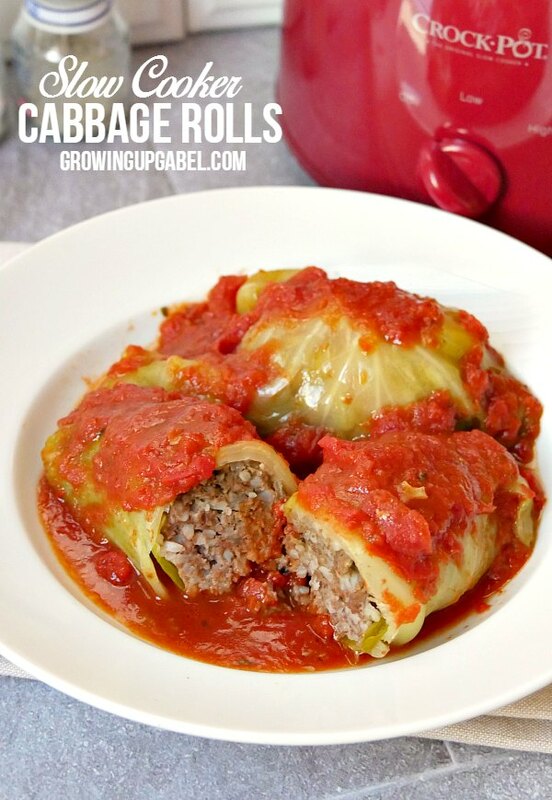 I love love love cabbage rolls and never thought to make them in a slow cooker!! I can’t wait to try this recipe. 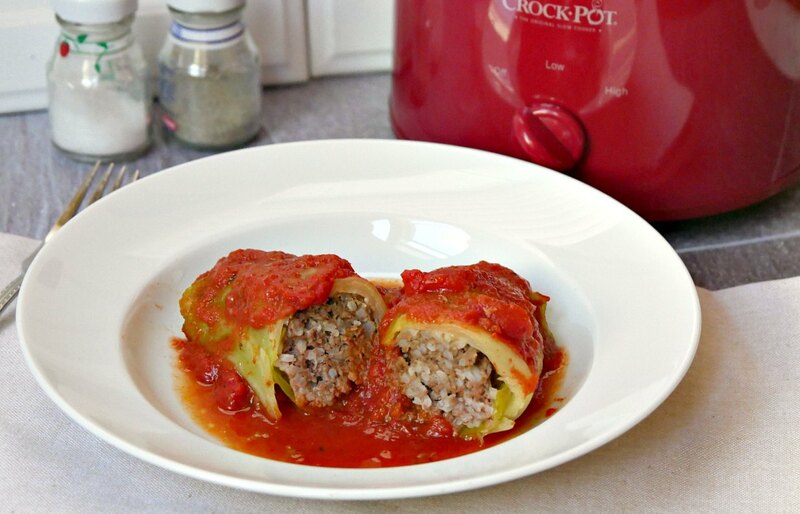 I love cooking in my slowcooker and adore cabbage rolls!!! Thanks for sharing!!! I love cabbage rolls but never thought to make them in a slow cooker. YUMMY! Stuffed cabbage is one of our family’s favorites. My mom always cooked hers on top of the stove in a Dutch oven. Definitely going to try this! So glad you shared it!!! Headslap! If I made this in the slow cooker, I could move it outside and not “stink up the house like my mom always did” as my husband says. And that is why I have never thought about making them until now. OMG – I lov Thanks for sharing on the What’s for Dinner Sunday Link up!e cabbage rolls but I’m too lazy to do all the pan cooking – in a slow cooker?? Oh yeah!! I usually cook these on the stove top for a long, long time but I have you keep checking to make sure there’s enough liquid in the pot – never thought of using the slow cooker. Makes a lot of sense and it’s much easier just put the rolls in and let it go. No more running back and forth to the kitchen. What a great idea. Thanks.